Bill and Melinda Gates said on Friday they would spend $10 billion over the next decade to develop and deliver vaccines, an increased commitment that reflects progress in the pipeline of products for immunizing children in the developing world. Over the past 10 years, the Microsoft co-founder's charity has committed $4.5 billion to vaccines and has been instrumental in establishing the GAVI alliance, a public-private partnership that channels money for vaccines in poor countries. By increasing immunization coverage in developing countries to 90 percent, it should be possible to prevent the deaths of 7.6 million children under five between 2010 and 2019, Gates told reporters at the World Economic Forum, Reuters informs. 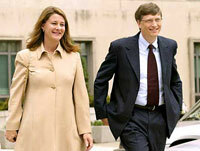 The ability to save millions of lives, Gates says. In fact, Gates told reporters that it is possible to save 7.6 million children under age 5 from death between 2010 and 2019 by increasing vaccinations in the developing world to 90%. Their hope is to build on previous success in poor countries like Malawi where coverage rates are now similar to those in Western cities, USA Today reports. "The Gates Foundation’s commitment to vaccines is unprecedented, but needs to be matched by unprecedented action. It’s absolutely crucial that both governments and the private sector step up efforts to provide life-saving vaccines to children who need them most," said Dr Margaret Chan, WHO Director-General. Vaccines and immunization have played a major role since the last century in overall health gains. Smallpox has been eradicated, polio is on the verge of being eradicated and more than 2 million deaths are averted each year. "Building on these achievements, we can take immunization to the next level, with the expanded uptake of new vaccines against major killers such as pneumonia and rotavirus diarrhoea," said Dr Chan. "An additional two million deaths in children under five years could be prevented by 2015 through widespread use of new vaccines and a 10% increase in global vaccination coverage," World Health Organization informs.